Yes, people, I have been knitting, and what follows is a round-up of my most recent FOs and WiP. 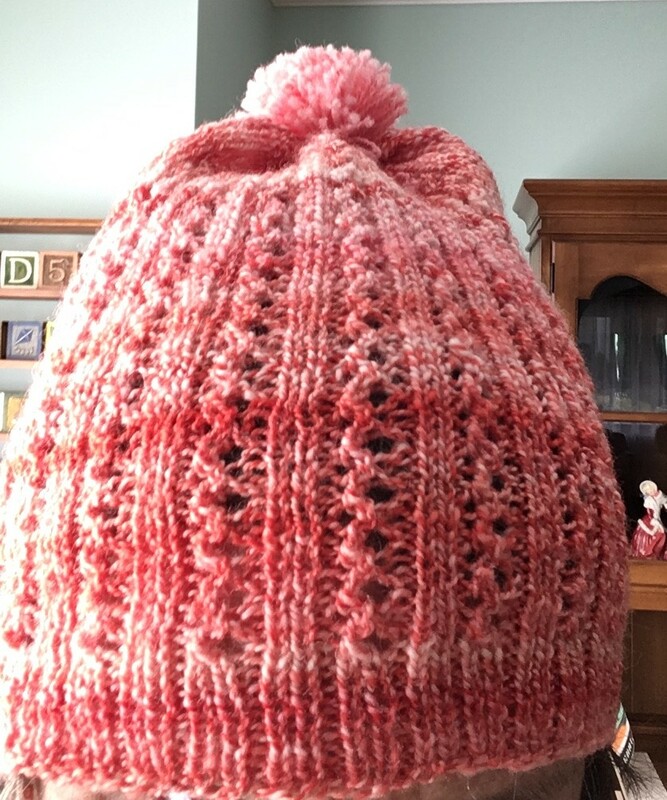 A hat I knitted to match a pair of fingerless mitts I made last fall. The picture captures the color of the yarn pretty closely. Yes, the yarn is my very own handspun, the fiber being Falkland dyed by Dana of Unwind Yarn in the coloway Flirt. Here’s that hat along side the mitts. The yarn is more reddish than pink. 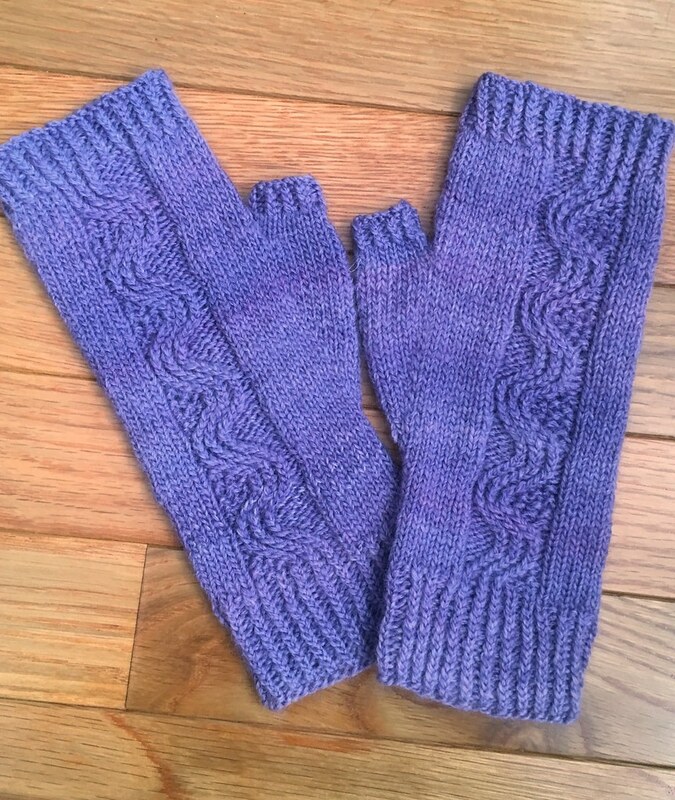 The pattern is Woodside Mitts by Paula McKeever. It’s a lot of fun to knit and is very stretchy. I started the hat not knowing whether I had enough yarn left to finish it. I just kept knitting until I was out of yarn. I had a little mini-skein set aside for the pompon. Originally I was going to just graft the ends together, but I decided when I was nearly finished to do a few rounds of crown decreases. Unfortunately, I didn’t write down how I did the decreases, but it turned out way better than I was expecting. Another project knitted from Unwind Yarns fiber, Falkland in the colorway Viola, that I spun. These are the Nalu Mitts, and I made them for one of my nieces. I need to get them in the mail. I came down with the crud shortly after I finished them and am only just now starting to feel human again. This is closer to the real-life color, but still not quite there. The pattern looks complicated, but it really isn’t. The only tricky part is working the seed stitch on the outside “curve” but in all honesty, even that isn’t particularly tricky. 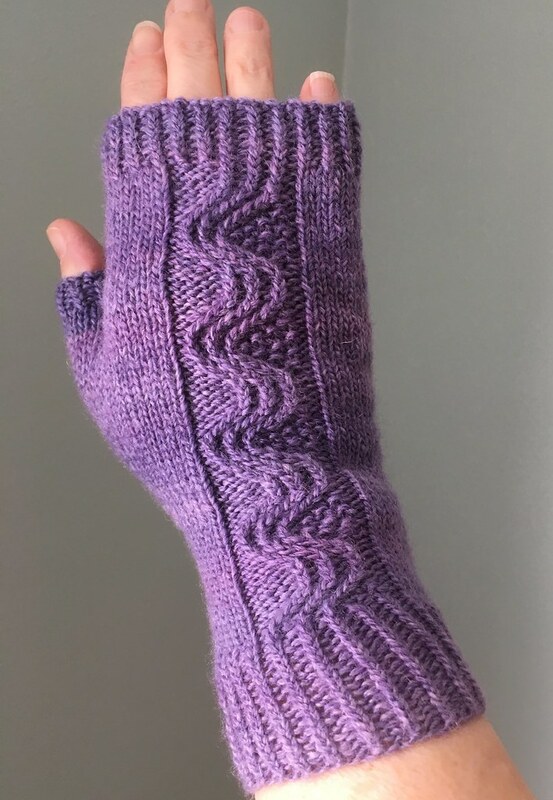 I love this pattern, but since the mitt is mostly stocking stitch, which isn’t very stretchy, it’s best to make these just a little on the snug side so that they don’t droop and bunch up. 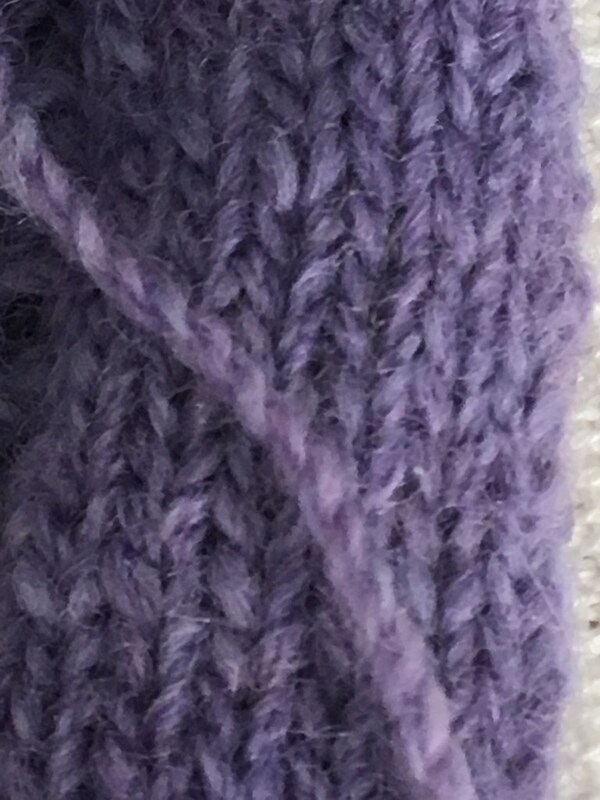 Here’s a close-up shot of a strand of the yarn on top of the knitted fabric. This yarn is a 2×2 cabled yarn which, when unknitted, looks like a chain. But when it is knitted up, it looks like the 4-ply yarn it is. The color in this picture is pretty close to the RL color, too. If you can picture something in between this picture and the one above it, you’ve got it. For those not in the know, a cabled yarn is a yarn that consists of two or more plied yarns that have been plied together. A 2×2 cabled yarn is made by plying 2 singles together to make a 2-ply yarn, then plying two strands of the 2-ply yarn together to make a cabled 4-ply yarn. For this yarn, I spun the singles Z-twist (clockwise), plied them together S-twist (counter-clockwise), then plied the 2-ply together Z-twist (clockwise). This makes a very round yarn that has great stitch definition and is a lot of fun to knit. I currently have only one project OTN and I plan to stay monogamous until this project is completed because it’s a baby blanket for a baby who has already made her appearance. I was a little late getting this project started, so I would like to get it done as quickly as I can. The pattern is a MMario design called Templeton, and I plan to finished the blanket with a knitted-on edging from a baby blanket pattern called Star Light Star Bright by Anna Dillenberg Rachap. I got the inspiration for combining these two patterns from a fellow Raveler, suespins. I love to peruse the finished projects of patterns I plan to knit. I have been practicing a left-handed knitting technique commonly referred to as Portuguese-style knitting on the baby blanket, and I have rapidly become very comfortable with this style of knitting. It is especially handy for doing stranded colorwork which is why I wanted to learn to do it. I currently do stranded colorwork two-handed, throwing with my right hand (English/American) and picking with my left (Continental). This works well and is comfortable for me, but I have tension issues because my tensioning when knitting Continental is rubbish. With Portuguese-style knitting, my tension is remarkably even and consistent, and because you can purl rather than knit (and the purl side is the side that faces the knitter), there’s far less chance of having floats that are too tight or too loose. I wish I had known about this technique for colorwork a long time ago. I’ve been doing some spinning, and even a little experimenting with different drive systems, but I haven’t been keeping very good records. I haven’t even recorded my last couple of projects on Ravelry. Bad spinner. Bad! But I will do my best to reconstruct what I did and I’ll share my finished skeins soon. 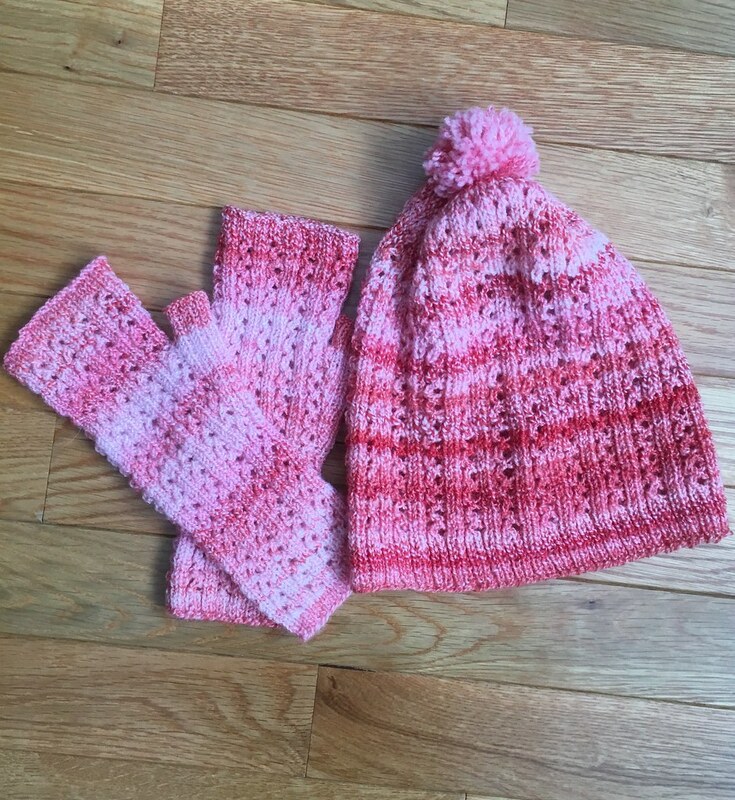 This entry was posted in Fingerless Mitts, Hats, Knitting, Lace Shawls, Spinning and tagged cabled yarn, fingerless mitts, knitting with handspun yarn, MMario, Nalu Mitts, Portuguese-style knitting, Templeton, Woodside Mitts. Bookmark the permalink. Those Nalu Mitts are beautiful!